COLLEGE PARK, Md. – The University of Maryland School of Theatre, Dance, and Performance Studies(TDPS) is partnering with theatre departments at Big Ten Conference schools to create a new playwriting and performance initiative. The group, known as the Big Ten Theatre Chairs, plans to commission, produce and publicize as many as five new plays in an effort to influence the national dialogue about women playwrights and the sorts of scripts needed by university theatre programs for performing arts education. The group plans to impact the dramatic underrepresentation of women playwrights in American theatre. In a recent study cited in the The New York Times, it was determined that of the 20,000 playwrights in the Dramatists Guild and on Doolee.com, an online database of playwrights, there were twice as many male playwrights as female ones, and that the men tended to be more prolific, turning out more plays. To draw attention to this imbalance and support greater gender diversity in the field, the Big Ten Theatre Chairs plan to commission women playwrights to write the initiative’s first three plays. The program’s first commissioned dramatist, Naomi Iizuka, is one of the nation’s most acclaimed young authors and head of playwriting at University of California, San Diego’s Department of Theatre and Dance. Iizuka’s plays include 36 Views, Strike-Slip and Anon(ymous). Her work has been produced by the John F. Kennedy Center for the Performing Arts, Joseph Papp Public Theatre and the New York Shakespeare Festival Actors’ Theatre. She is the recipient of a PEN/Laura Pels Award, a Rockefeller Foundation MAP grant, an NEA/TCG Artist-in-Residence grant and Princeton University’s Hodder Fellowship. Her first draft of the commissioned work will be reviewed and discussed in October by the Big Ten Theatre Chairs in a meeting at Northwestern University. 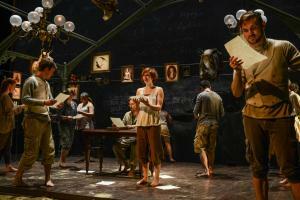 A full draft of the new play will be completed by spring, 2014 and will be performed during the 2014-2015 season at one or more Big Ten schools. The group plans to commission one play by a woman playwright each year for three years, and as the project progresses, will commit to additional years. 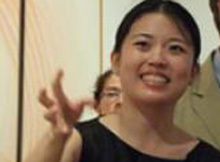 If Iizuka's play is chosen for UMD’s TDPS 2014-2015 season, she will be invited to campus to workshop the play with TDPS students. Advocacy for the Arts and Humanities: "The Heart of the Matter"
Just two weeks ago at the Clarice Smith Center’s 2013-14 season opener, we had the opportunity to experience the artistry of Harry Belafonte, as one of the narrators of jazz bassist Christian McBride’s four-part suite, The Movement Revisited. The performance culminated the symposium, “Civil War to Civil Rights, the Well-Being of a Nation,” a collaborative partnership between the Center, the College and the Schools of Public Health and Public Policy. Mr. Belafonte recounted a story of an earlier visit to our campus. Though I cannot tell the story with the emotion and impact of Mr. Belafonte, I want to share it with you now. In the mid-1960’s Mr. Belafonte recalled performing in Cole Field house at the University of Maryland in an event that included remarks by the Reverend Dr. Martin Luther King, Jr. Mr. Belafonte commented that there were a number of security guards backstage and one had a very serious demeanor. This guard did not talk with others, smile or in any way engage his fellow officers or the guests but kept a menacing countenance. Later that evening when Mr. Belafonte returned to his accommodations, he was given an envelope that had been left there for him. The envelope, he noted was odd, and unusually heavy. When he opened it in his room, six bullets fell out onto the desk. The note that accompanied them said something like this: “These bullets are from the chamber of my service revolver. I have carried them and been trained to use them to kill in an effort to protect. However, after what I heard and saw tonight, I have been transformed. These bullets will never be in my possession or be used to kill another human being”. Mr. Belafonte’s story is a fitting tribute to the 50th Anniversary of the March on Washington; an interesting insight into a possible connection between University history and the history of the nation. But the element of the story I want to focus on is transformation, specifically the transformative power of ideas and alternative visions. Transformation is one of the highest aspirations of our educational enterprise. A stated aim of the College mission is to prepare our students to understand the transformative power of the imagination. The booklet, Be Worldwise, the Dean’s Lecture Series and research video series encourages members of our community to transform themselves through knowledge, experiences and ideas gleaned from encounters with the values and perspectives of the arts and humanities. Transformation was among my goals when I took the position as dean. While I hold no illusions that changes I might initiate would be as profound as the kind of transformation described by the security officer, I continue to focus on making our accomplishments more widely known and better understood both on campus and off. The Year in Review for 2012-13 is in preparation and will be released later this fall. And, though we will not launch another 8-part faculty video series this year, we are planning to take advantage of an important new video about the arts, humanities and social sciences as a way to showcase the importance of our work. From the outset, I have framed my goals as building community and advancing our common purpose. Since then, I return each fall to give you an update on our progress; to announce new initiatives and to share my perspective on the overall well-being of the college. Today, I want to do just that. As you know, we’ve faced difficult financial times over the past several years. Nevertheless, we’ve taken a few important steps. With the funds we received for merit and COLA for this fiscal year - after five years with neither, and with furloughs - we took deliberate steps to begin to address issues of salary compression. In collaborations between units and the office of the dean we were able to devise strategies and direct resources to make a small dent in this large problem. We know we cannot right the compounded problems of five or more years in one year, but we now have an approach that includes affirmative steps toward improving the situation. Under the leadership of Laura Nichols (WMST), staff members in the College have been working over the past year to develop a formal staff group that would parallel the Collegiate Council. This group would meet regularly with the dean and help to create a sense of community for ARHU staff, identify opportunities for professional development, create new avenues for communication, and provide a means for staff to become more knowledgeable about and connected with the mission and vision of the College. The college budget continues to improve but the process is slow and it does not fully address the major challenges we face, especially when it comes to supporting our instructional load. The underfunding of our college relative to our contributions to undergraduate education is an old story. Over the last five years, ARHU has provided approximately one quarter of all undergraduate credit hours but received far less than its proportionate share of the state budget. Part of my job is to identify these inequities and fight to overcome them. And, while I have reason to believe the new provost understands and wants to address this, I don’t expect that it will happen this year. On the positive side, the college has made great strides both through sponsored research and gifts. In the three most recent fiscal years, research award dollars have increased 18.5% thanks largely to the National Foreign Language Center, the School of Languages, Literatures and Cultures, the Department of Linguistics and MITH. Our research support activities in the College have increased and we are offering grant-writing workshops and providing consultations in grant preparation. Last year, the University closed the Great Expectations capital campaign having raised a record $1 Billion. ARHU raised over $59 million of that amount and doubled the number of ARHU donors that contributed to the prior campaign. Our efforts to launch new programs and fulfill our visions are greatly enhanced by our ability to raise external dollars to support them. Another important way we increase our impact and realize the programs we envision is through partnerships that promote research, scholarly and educational excellence. I want to highlight a few of our successes. The Arts and Humanities Institute is in development and will be a dynamic and synergistic locus for interdisciplinary and applied arts and humanities research and scholarship. Through an innovative adaptation of a design school model, the Institute will stimulate, represent, and share the dynamic intellectual enterprise of the College of Arts and Humanities. It will serve as an incubator for change encouraging new initiatives in programmatic development and scholarly excellence. It will provide a transdisciplinary arena for scholars in the arts and humanities to demonstrate the nimbleness and breadth of the college in consideration of and application to the most pressing questions of our time. As an example, the Baltimore Think-a-thon, held in May in partnership with the UM Carey Law School, was a gathering of artists, scholars and Baltimore community leaders that identified and brainstormed solutions to the city’s most pressing social problems. Closely related is the Integrated Arts initiative in the Visual Arts. As many of you know, earlier this year the University entered into an agreement to consider a partnership with the Corcoran Gallery and College of Art and Design in Washington D.C. Throughout the summer, faculty in our departments of Art and Art History along with the directors of Driskell Center and the Art Gallery participated in a task force that engaged in an intensive process of review and due diligence. The report and recommendations will be forthcoming soon. The outcome will depend on actions to be taken by Corcoran’s Board of Directors and the State Board of Regents. At this point, President Loh is engaged in discussions with both groups. This process has brought the strengths, challenges and opportunities involved in building the visual arts to the attention of the campus, and President Loh repeatedly says that a great university must be strong in the arts and humanities, not just in the sciences. He sees this partnership as having the potential to catapult our capacities and stature in this area. Regardless of the outcome with the Corcoran, the process has built cross-campus relationships and generated new ideas and energy that can strengthen internal partnerships and promote future collaborations between the visual arts the performing arts, the humanities, architecture, engineering, and the rest of the campus. For ARHU, this Corcoran initiative has led to awareness of and engagement in the arts and humanities all the way up to the level of the State Board of Regents. Next week, Provost Rankin and VP for Research Patrick O’Shea will formally announce a major initiative in which ARHU plays a key role; the formation of the Maryland Language Science Center (launched September 27, 2013). The Center, led by our linguistics department, is a collaborative effort involving language scientists, drawn from 14 departments and centers in 6 colleges across the university. Its goal is to foster interdisciplinary research and training that will advance a deep understanding of language, promote global engagement and deliver world-class solutions to some of society’s most pressing language problems in education, technology, and health. Please stay tuned for more details and the full announcement. This fall, we are also excited to launch the Foxworth Creative Enterprise Initiative funded by Domonique (AMST, ’04) and Ashley Foxworth (English ’06). As young alumni of color, their support signals a new and important direction in giving to the College. The Initiative will provide funds for the development of courses that bring students into a collaborative learning and working relationship with members of underrepresented communities on the Maryland campus and in its surrounding environs. The announcement was sent out yesterday and I hope that those of you interested in creating such a course will go to the information session and submit a proposal. Whether working in interdisciplinary partnerships or as independent scholars, our faculty continue to garner a number of prestigious national awards as well as important campus recognitions. While you can learn about these in greater detail on the ARHU website or in the forthcoming Year in Review, I would like to acknowledge a few of them today. In the past year a number our colleagues have received national awards including a Guggenheim, a Tony nomination, Year-long NEH Awards, along with numerous book awards. Campus level awards that deserve special recognition are: Professors Robert Levine, who will be honored as a Distinguished University Professor and Marilee Lindemann, who will receive the Kirwan Undergraduate Education Award at the University Convocation on October 8th. Professor Christina Hanhardt received the Undergraduate Studies Program Teaching Award; the Department of American Studies received the Ethnic Minority Achievement Award as Outstanding Instructional Unit and Professor Lisa Mar received their Outstanding Faculty Award. Professor Sangeeta Ray was awarded Outstanding Director of Graduate Studies and Professors Laura Demaria and Psyche Williams-Forson were named Graduate Faculty Mentors of the Year. There are numerous other outstanding faculty accomplishments and I’m sure that there are some important awards that I have inadvertently overlooked. Nevertheless, my goal here is not just to recognize individual colleagues but to demonstrate that accomplishment at the highest levels characterize our community. You have met our thirteen (13) new faculty and as you can see from the bios in the program, we continue to attract to our campus people with stellar accomplishments and exceptional promise. The responsibility of those of us who are seasoned faculty is to provide the resources, intellectual climate and mentoring that will permit the talents of our new faculty to bloom and encourage them to remain rooted in University of Maryland soil. Linking our efforts to build community with our goals of excellence in education and scholarship is our Diversity Initiative. Excellence in ARHU depends upon our having a diverse faculty, staff and student body along with an inclusive and supportive environment that nurtures growth and productivity. In November 2011, I appointed a Diversity Task Force that has since examined available data, both quantitative and qualitative, and held a series of focus groups with undergraduate and graduate students, faculty and staff to assess the College’s current standing as related to diversity and inclusion. Last spring they presented their report. Using the data analysis and recommendations of that report, we have prepared an implementation plan. The first Goal is: The College will provide the leadership and infrastructure needed to create a more diverse and inclusive College population. The second, The College will create a climate in which diversity; inclusion and equity are valued and realized at both the College and Unit levels. And the third, The College will develop a vision of diverse academic programs that make diversity and inclusion intentional in teaching and learning across the curriculum. Examples of implementation actions are that each member of the Dean’s senior staff as well as unit heads are tasked with identifying specific actions related to diversity, inclusion and equity to be accomplished as part of their yearly goals. A second example of an implementation action is for departments to have forward-looking discussions about curriculum, the anticipated make-up of their students and faculty and the relationship between them. Be on the lookout for the announcement. I encourage you to review the plan carefully and share your ideas for implementation within your unit and within the college. Finally, a key component of the College’s diversity efforts is our participation in the Advance Program. ARHU’s Advance professor this year is professor Laura Rosenthal from the English Department. Laura will be working with the dean’s office, the Advance program, and most importantly with our faculty to help facilitate the college’s actions in addressing issues of diversity. Each year I’ve said something about advocacy for the Arts and Humanities because it is a major part of my work and the work of the college. Our research and scholarship, our exhibitions and creative performances speak well for themselves to those who choose to listen, but increasingly we find that we must devise new ways to be heard over the din of a growing anti-intellectual and utilitarian discourse. Recently, debate and discussion about the future of the arts and humanities; it’s viability; it’s importance in this era of big data, technological innovation, and tight job markets increased in intensity after several Republican governors –in Texas, Florida and Wisconsin publically questioned the value of liberal arts instruction. They focused on majors in the arts, humanities and social sciences offered at public colleges and universities and they threatened to defund these programs. As faculty and staff of the flagship university in our state it is important that we are aware of and engaged in this national discourse even as we critique its basic assumptions. Our University’s mission, “to create and apply knowledge for the benefit of the economy and culture of the State, the region, the nation, and beyond,“ requires no less of us. Our participation in this dialogue will be highlighted through Be Worldwise: The ARHU Dean’s Lecture Series which will feature two members of the commission: John Lithgow, the actor and Annette Gordon-Reid, professor of law, professor of history and professor at the Radcliffe Institute for Advanced Study, Harvard University. The Commission has produced a companion video that frames a conversation that we will continue throughout the year. I want to close with a brief clip which I hope will inspire you to view the entire video on the college website, read the report, and join us in transforming public discourse on the arts and humanities. Thank you for your attention. Let’s Party! American Academy of Arts and Sciences, The Heart of the Matter. Cambridge Ma: 2013, p 6. Martin Wollesen plans to bring the same inventiveness to his new job as executive director of the Clarice Smith Performing Arts Center in College Park that he did to his previous job in California. Wollesen will be working with the UMD School of Music and also the School of Theatre, Dance and Performance Studies. He will also be overseeing the visiting artists’ program, raising funds and finding new ways to connect students and the public to the arts at the university. For the past nine years, Wollesen has been director of events and artistic director for ArtPower!, the program for visiting artists at the University of California in San Diego. During his years there, he earned a reputation for innovation as a way to engage both nonperforming students and general audiences in music, dance, and film programs. I’m pleased to announce the appointment of Alejandro Cañeque as Interim Director of the Latin American Studies Center, effective August 23, 2013. Currently an associate professor in the Department of History, Alejandro is a specialist in the history of colonial Latin America and the Spanish empire. He teaches courses on the history of the encounter between Europeans and natives in the New World, colonial Spanish America, early modern imperialism and colonialism in the Atlantic world. In addition to the United States, he has taught in the United Kingdom,Mexico, Peru and Spain. Alejandro’s main area of research is the political and religious cultures of the early modern Spanish world, with an emphasis on colonial Spanish America. He is the author of “The King’s Living Image: The Culture and Politics of Viceregal Power in Colonial Mexico” (2004) and contributor to the edition of Juan de Palafox’s “Virtues of the Indian” (2009). His works, “The Americas,” “Historia Mexicana,” “Revista de Indias” and “Histórica,” were published in the Colonial Latin American Review. He is currently working on a book-length study of the politics of martyrdom on the frontiers of the Spanish empire in the sixteenth and seventeenth centuries. Alejandro holds a licenciatura (or license) in geography and history from the Universidad de Sevilla in Spain, and a M.A. in Latin American studies and a Ph.D. in Latin American history from New York University. I also announce that Jennifer Baur Sanchez is the center’s new coordinator, replacing Winslow Robertson and responsible for course scheduling, events and publicity. Finally, I want to take this time to thank Karin Rosemblatt for her service as the center’s director for the past five years. 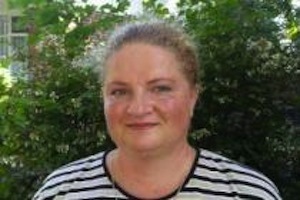 The School of Languages, Literatures, and Cultures has appointed Zhanna Gerus-Vernola the Maya Brin Distinguished Lecturer in Russian starting fall 2013. In addition to teaching, she will organize all events and activities related to the new Maya Brin Residency Program, established through a generous $600,000 gift from University of Maryland Professor Emeritus of Mathematics Michael Brin. The residency program, named in memory of Brin’s mother, Maya, who taught Russian in the Russian program for nearly 10 years, is designed to bring leading Russian scholars, artists and cultural figures to campus for short-term stays between one week and one semester. A lecturer in Russian at Maryland since 2006, Gerus-Vernola has been the primary beyond-the-classroom organizer for the Russian program and has been active in providing program enrichment through contacts in the community. “Ms. Gerus-Vernola unites excellence in teaching and a range of administrative skills with a strong attachment to student engagement and a serious commitment both to the new Maya Brin Residency Program and to the Maryland Russian program,” said Elizabeth Papazian, an associate professor of Russian and film studies in the School of Languages, Literatures, and Cultures. Gerus-Vernola holds a bachelor’s and a master’s degree in psychology from Moscow State University and a master’s degree in Russian language and linguistics from the University of Maryland. She has completed her Ph.D. coursework in second language acquisition and Russian at Bryn Mawr College. Additional professional experience includes a three-year position as a program officer for the Future Leader Exchange Program (FLEX) at the American Councils for International Education; four years as a co-organizer of an annual international sports festival for handicapped athletes in Russia; and a year as a practicing psychologist in Moscow working with women from war-conflict zones. The university is exploring a partnership with Washington, D.C.’s famed Corcoran Gallery of Art and Corcoran College of Art + Design that could lead to access to the gallery’s $2 billion, 17,000-piece collection, enhanced art and design opportunities for Maryland students, and increased visibility and presence for the university in the nation’s capital. President Wallace Loh in April signed a memorandum of understanding with the head of the Corcoran Board of Trustees and has appointed an 18-member task force to consider a formal collaboration. It is scheduled to report its findings to him by the end of the summer. 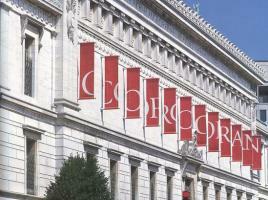 The Corcoran was established in 1869 as D.C.’s first private art museum, dedicated, in the words of founder William Wilson Corcoran, to “encouraging American genius.” Its renowned collection, housed just a block from the White House, includes works by Degas, Monet, Picasso and Sargent. The college opened in 1878 and today has approximately 550 undergraduate and graduate students. In recent years, the museum has struggled to overcome severe financial troubles, including $7 million operating deficits for the last two years and a $130 million backlog in building repairs. The agreement signed by the Corcoran and UMD notes the advantages of UMD’s management expertise, financial strengths, economies of scale and capacity to help run the Corcoran’s administrative side, in such areas as student services, fundraising, facilities management and human resources. The UMD task force, led by Senior Vice President and Provost Mary Ann Rankin; Curlee Holton, interim executive director of the David C. Driskell Center; and School of Architecture, Planning and Preservation Dean David Cronrath, is now investigating the possibilities for new courses, joint degrees and innovation studios, which would bring together students and faculty from disciplines like engineering and business with the arts. “All our students will have to be creative problem-solvers and designers as well as entrepreneurs in their jobs,” Cronrath says. If the task force recommends moving forward, the University of Maryland Board of Regents and the Corcoran Board of Trustees will vote on the decision. This partnership would be unique but not unprecedented. The University of California, Los Angeles operates the Hammer Museum, and Johns Hopkins University has partnered with the Peabody Institute for more than three decades. “It’s a wonderful opportunity, and it takes great courage and leadership for President Loh to imagine it and make it possible,” Holton says. An African-American art collection valued at more than $2.2 million now belongs to the university’s David C. Driskell Center. The nearly 270 paintings, sculptures and other works bequeathed by Sandra Anderson Baccus, who died last year, and her late husband, Dr. Lloyd T. Baccus, make it the center’s largest gift. Mrs. Baccus served on the center’s board from 2004 to 2006. Familiar names such as Clementine Hunter, Romare Bearden and Palmer Hayden are represented, as are a range of formats and subjects. The collection includes abstract metal sculptures addressing lynching, fine drawings evoking nights at the famed Apollo Theater and even a pair of creatively decorated shoes. “There were a number of artists she was interested in, and her husband was interested in a different group,” says Curlee Holton, interim executive director of the center. He says it makes for a diverse and “exceptional” collection. The College of Arts and Humanities would like to congratulate Art History and Archaeology Professor Abby McEwen on receiving the 2013 Dedalus Foundation Senior Fellowship for her project, a book titled “Revolutionary Horizons: Art and Polemics in 1950s Cuba.” The fellowship includes a stipend of $30,000, the maximum amount of money awarded to a recipient. Her book, which she expects to complete by the end of the fellowship year, considers the emergence of abstract art in Havana and its promulgation within a radicalized cultural filed, circumscribed by the national discourse of cubanía and the Cold War ideological divide. Abstraction, both a physical form and an ideological platform, signaled new possibilities for art as a means of social and political transformation, and is the focus of McEwen’s research. In addition to the Dedalus Senior Fellowship, her project has also been supported by grants and fellowships from the Metropolitan Museum of Art and the University of Maryland Graduate School. The Dedalus Foundation’s Senior Fellowship program is intended to encourage and support critical and historical studies of modern art and modernism. Under this program, fellowships are awarded to writers and scholars who have demonstrated their abilities through previous accomplishments and who are not currently matriculated for academic degrees. Congratulations again to Assistant Professor McEwen on receiving this prestigious fellowship! University of Maryland students took over public space in the Long Branch neighborhood and put a spotlight on an area that may soon get even more attention with the Purple Line. baseline">Hands-on work takes on new meaning for Fox. She spent the semester along with other classmates using the Long Branch community as their canvas. baseline">“This piece is called Thirsty for Change,” says Kristen Fox, a graduate student at the University of Maryland. 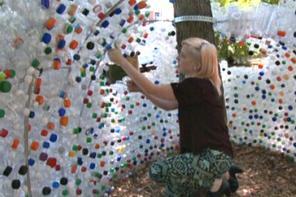 Her piece consists of 3,444 plastic bottles. baseline">The two-week public art display aims to connect the neighborhood while showcasing what the area has to offer. baseline">“This temporary work is part of thinking about the longer term vision,” says Ronit Eisenbach, a professor at the University of Maryland. baseline">Part of the future plans includes the highly-anticipated and controversial Purple line, a light rail system proposed to go through Long Branch.